Darren and Deborah Petersen 'found' each other while attending the Alberta College of Art and Design in Calgary, Alberta. Together, they established Sparrow Glassworks in 1997 shortly after the birth of their first child. Deborah and Darren work together in the studio. Deborah also does beadwork at the torch under the name ‘Bead Baroness’. The studio is located in an established residential neighborhood in central Red Deer (->map). Raising children and operating a home-based 'creative' business has been a tremendous opportunity to meld together work, play and family. 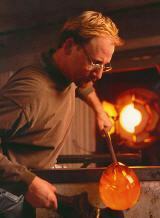 Three categories of glass work are produced in the studio. We take great pride in being highly versatile creating a vast range of items from fine venetian stemware to nature inspired sculpture and decorative giftware. bubbles, these pieces more often than not reference nature. monolith type forms. Also may include vessel forms.